The other day I tackled organizing my medication shelf. I had been sick the week before and had spent too much time rummaging for over-the-counter medications, unaware of what hid behind the next bottle or box. For many seniors, medication management is an important component of care. Updating and reconciling medication is more important than an organization system, however the right organization system can increase the safety of medication management and provide clarity for family and professional caregivers. While there are several methods and storage options for organizing your medications I wanted to provide you with some ideas and tips to get started on the journey of organizing your, or your loved ones, medications. When it comes to any type of organization, getting started often is the most difficult part. 1. Develop a plan. The first step to organizing your medications is to develop a plan. Examine your current storage system–what works and what doesn’t work. For my organization purposes I liked the location of my medications, I keep mine in a dedicated kitchen cabinet. However, instead of remaining on one shelf they had taken over a couple of shelves and daily medications even remain on the kitchen counter. Reigning in the run away medications was my main goal. 2. Decide on a storage location. Medications need to be stored in a cool, dry place, out of the reach of children and pets. Bathroom medicine cabinets are less than ideal due to the humidity and changing temperatures. Make sure the storage location is easily accessible. 3. Sort your medications. The way you sort your medications is up to you. The way I sorted mine were in two groups: the first group was my daily prescriptions and vitamins, the second group was the less commonly used vitamins, cold and flu medicines, as well as pain relievers. This system is very simple, and you may need many more groupings. I do recommend having a separate group for daily medications. This makes inventory and reconciliation of these most important prescriptions easier. Other possible groupings could include: Cold and Flu, Allergy, Bandages, Daily Medications, First Aid, Vitamins, etc. 4. Brainstorm the best storage containers. I am partial to shallow baskets or trays. This method allows the medications to be easily transported and you have a clear view of what you have available. But, depending on your storage location, you may need to discover another container method. A trip to a dollar store or your local organization store such as The Container Store, may provide creative solutions for your space. I also recommend investing in a medicine safe for medications that are at risk for being abused. 5. Organize and label. The final step in the process is putting it all together. Place your groupings in your baskets, bins, or drawers. Make sure the new system is labeled in order to locate desired medication quickly and to maintain your new system. 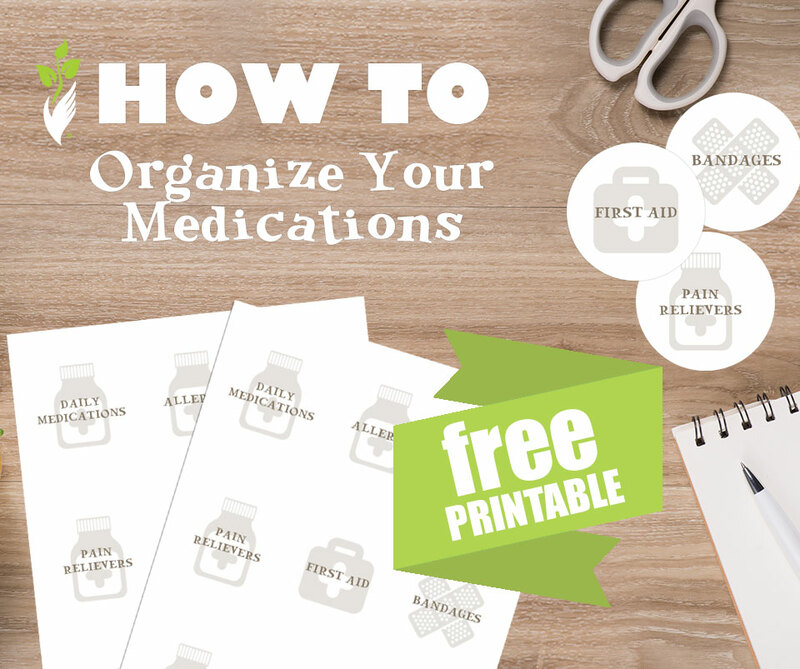 We have provided a free printable with common medication grouping labels for your use! Simply print, laminate if desired, and adhere to your new organization system. 6. Request a medication reconciliation. Regular medication reconciliations are recommend, especially if there has been a recent hospitalization and change in the medication schedule. Discuss with your doctor your medication list (all regular medications, including prescription, over the counter and vitamins) and the process of having a thorough reconciliation. Now that you have all your medications organized, create an inventory of daily medications to bring with you to doctor’s appointments and have displayed for new caregivers or family members. Medication organization, while it may seem time consuming, is vitally important. Half of elderly people who take medicine four times a day don’t take it as prescribed, according to Pharmacy Times, a journal for pharmacists. Creating an organized system is a great first step in safely and effectively managing your medications.